Joanna Gaines had a very busy weekend after her husband Chip let it slip that the couple are working on a return to TV. And while we absolutely can't wait to see what a cable network devoted to all things Magnolia looks like, we totally understand why Jo needed to take it easy on Monday. When you have a baby as cute as Crew and a bed as comfy as Jo's, the network meetings can wait. 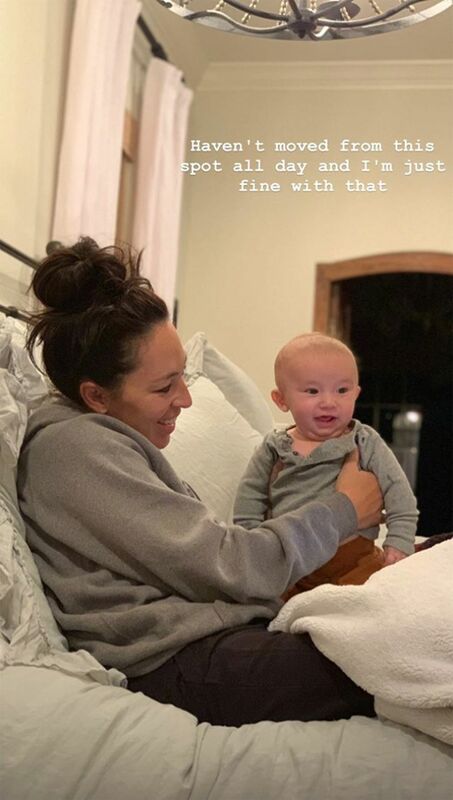 Jo took off her media mogul hat and went into mama mode for some quality time with baby Crew this week, posting a sweet pic of the two of them in bed together, noting, "Today's been a 'cancel all your meetings and stay in your sweats' kinda day." Clearly, Jo needed some downtime—and by taking it, she's showing all the mamas who consider her #goals that it is okay to say you need a break. We live in a fast-paced world where hustling is praised and people wear their busyness like a badge of honor, but as Joanna showed us this week, we all need to slow down sometimes. In her Instagram Stories she showed off her sweatpants and top-knot style, noting and that she and Crew hadn't moved from her bed all day. "I'm just fine with that," she noted. Joanna Gaines is one of the most influential women in our culture right now, and hopefully, she'll influence more mamas to take time off when they need it. It's okay to skip Gymboree this week if you just need to rest with your baby. It's okay to spend your Saturday in bed instead of in the laundry room. And it's okay to use one of your sick days at work to just focus on your mental health, mama. Joanna Gaines took a mental health day to focus on herself and her baby—because you can't hustle if you're burned out. We all need to recharge once in a while. Thanks for the reminder, Jo.